Hand-picked at the Experience PRS 2013 event! PRS David Grissom DG 2x12 Speaker Cabinet. Hand picked at the Experience PRS 2013 event! Here's a limited edition PRS David Grissom Custom 50 amp we just grabbed. Hand wired, vintage style single channel 50 watt EL34 powered tube amp. 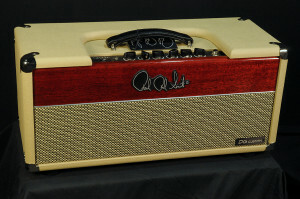 One of only 10 being offered with NOS Brimar pre-amp tubes. Grab it while you can! We also picked up the 30 watt version -- check that out too!